When most people first see Riddles & Riches the first game that is probably going to come to their mind is the classic game Clue. You are moving around a mansion trying to solve a mystery/riddle after all. While I am not a huge fan of riddles, I do occasionally enjoy solving some riddles. I didn’t have high expectations for Riddles & Riches but it looked intriguing enough that I thought it was worth checking out. Solving the riddles in Riddles & Riches can be pretty fun which is unfortunate as there isn’t much else to the game. Assemble the gameboard and set it up vertically. Each player takes one door card, one key, and one pawn. The players will place their pawns on the start space. Choose three riddles (recommended you start with the earliest riddles) and place them on the corresponding spaces on the gameboard. The riddles are placed face up on the board and the riddles are read out loud. Look through the hint cards and find the cards that correspond to the current riddles. 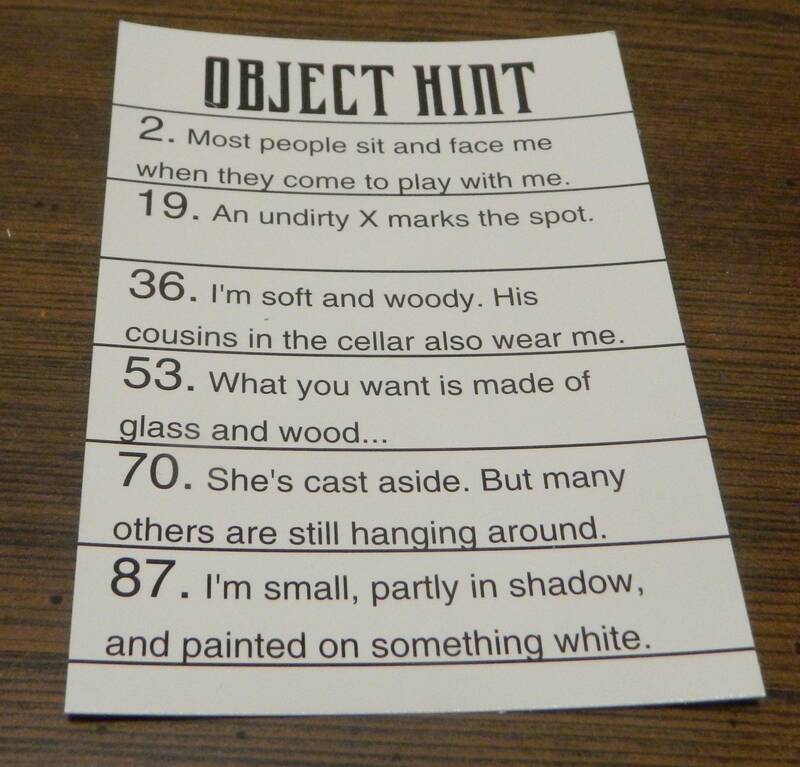 There is one room hint, object hint and bonus hint for each riddle. A hint card corresponds to the riddle with the same number. Place the picture cards, treasure cards, and the riddle solution book to the side. The objective of the game is to solve riddles. To solve a riddle you need to know the item that the riddle is referencing and in what room the item is in. This is riddle two. Players will have to determine what object this riddle references and in what room the object is located. A player begins their turn by rolling the die. The number they roll will determine how many spaces they can move their pawn. The player may move their pawn vertically or horizontally on the gameboard. The player can either use their full roll or stop on any spaces they move through. A player may not enter the same hint space on consecutive turns. Players may also not enter a room with a door card on it unless they have a key. The yellow player has rolled a three so they moved their pawn three spaces. After moving their pawn the player will take an action based on the space their pawn stopped on. Play then passes to the next player clockwise. Unoccupied Room: When a player lands in an unoccupied room, they may take the corresponding room picture card and look at it until their next turn. If two players are in the same room, they must share the card. This player has landed in the library so they will get to look at the library picture. 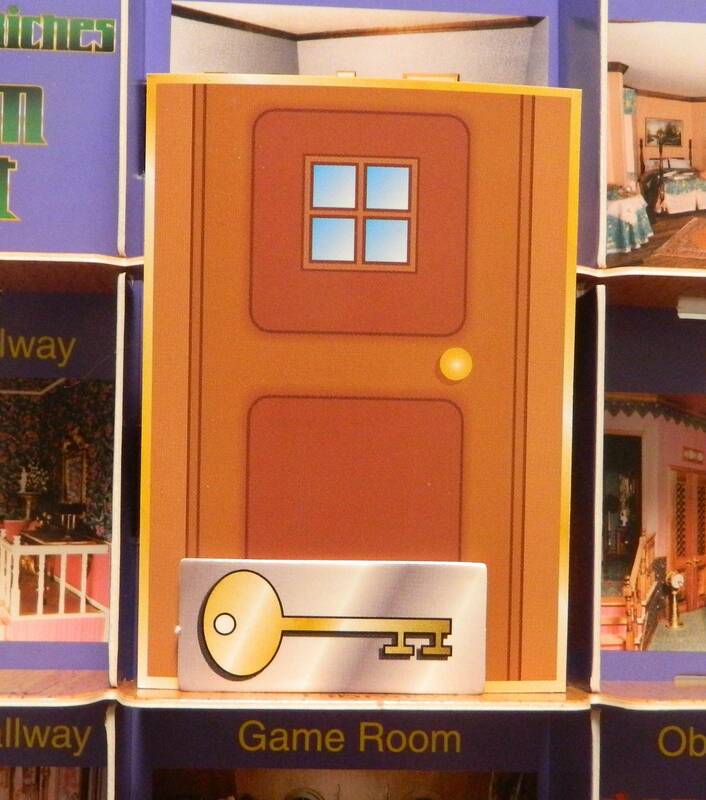 Hint Room: When a player lands in a hint room, they can take one of the corresponding hint cards from the gameboard. 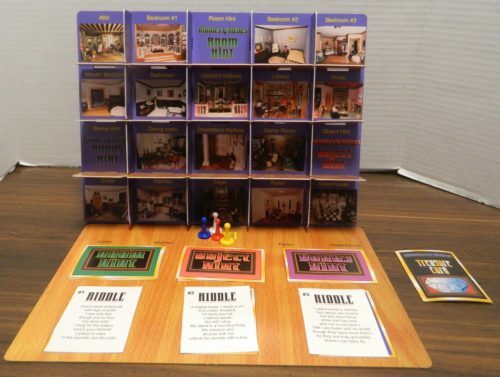 The player can choose which riddle they want the hint card from. Players will get to keep whichever hint cards they take. When all of the hint cards of the corresponding type are gone, the player can take a corresponding hint card from another player. Blocked Room: If a room is blocked by a door, a player may not enter it unless they have a key. If they have a key they can add it to the room that the door was on and take the door card. They will then take the action of the corresponding room. Meanwhile if a player has a door card they can place it on any unoccupied room or hint space. This room has been blocked off by a door. They will need to use a key in order to access the room. Move the other player to another unoccupied space on the board. Take a hint card from the other player. Take a door from the other player. Take a key from the other player. These two players are in the same room. 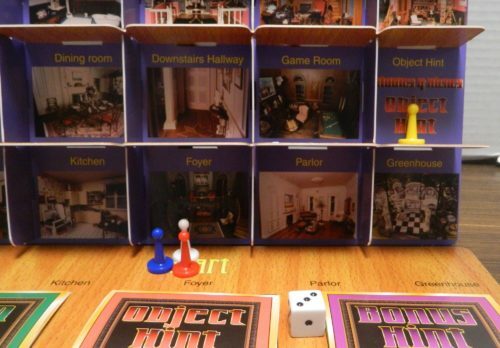 The player who moved to the room second will get to do something to the other player. When a player thinks they know a solution to one of the riddles, they can try to solve it on their turn. They write down the item they think the riddle refers to and which room they think the item is in. The player then looks for the answer to the riddle in the riddle book. If the player solved the riddle they will collect one treasure card. They should not tell the other players the solution as the riddle stays in play for the rest of the players. If the player did not solve the riddle, they can no longer solve the riddle for the rest of the game. They will need to try to solve the other riddles. If a player fails to solve two of the riddles, they are eliminated from the game. The first person to earn two treasure cards wins the game. This player has earned two treasure cards so they have won the game. As I mentioned at the beginning of the review, when most people see Riddles & Riches they are going to immediately compare it to Clue. That comparison makes sense at first but once you start playing the game you realize that the two games have very little in common. Honestly the only thing the two games share in common is that you are moving around a mansion trying to find clues to help you solve the mystery/riddles. Clue focuses on using your deduction skills to figure out what cards are missing from all of the players. 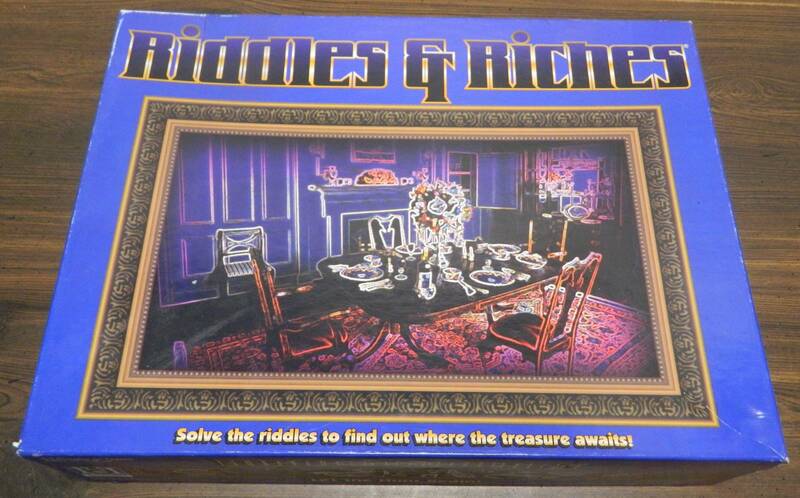 Meanwhile Riddles & Riches focuses on figuring out riddles. The two games play quite a bit differently where I wouldn’t even compare Riddles & Riches to Clue. As stated right in the title, riddles are the key to Riddles & Riches. Each riddle in the game leads to a specific item in a specific room. By solving the riddle you figure out both the room and item which gets you one step closer to winning the game. To help you there are hints scattered around the mansion which give you information that helps you figure out the item or the location. Generally I found this aspect of the game to be kind of fun. I am not a huge fan of riddles but it is occasionally fun trying to figure them out as it gives you a sense of satisfaction. People who enjoy solving riddles should enjoy this aspect of the game. If you hate riddles though, I can save you some time and tell you that Riddles & Riches is not going to be for you. 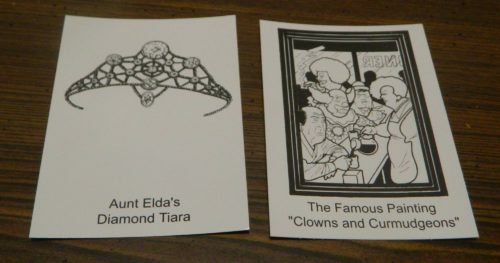 While the riddles are kind of fun to solve, I would say that they are kind of a mixed bag. Some of the riddles can be difficult but I would say a lot of them are pretty easy. 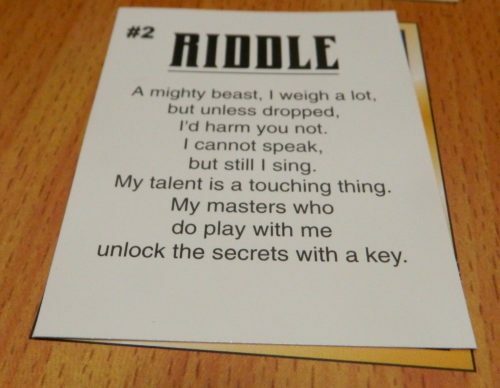 The riddles get more difficult the further you get into the deck but the first riddles are way too easy. Quite a few of the earliest riddles I was able to solve without looking at any rooms or hints. Figuring out what item the riddles refer to is really simple as the riddles think they are more clever than they actually are. This leads to the game being more of a scavenger hunt as you run around the mansion trying to find the object that the riddle refers to. I would say most of the challenge in the game comes from figuring out which room each riddle is referencing. The room hints lead you in the right direction but usually only give you a small nudge in the right direction. You are still going to have to look in several rooms to find the one you are looking for. Whichever player is able to find the corresponding rooms the quickest is going to win the game. This kind of defeats the purpose of the riddles as you need to roll well in order to win the game. When you reach each room you are given the opportunity to look at a larger picture of the room. These pictures are much larger than those on the gameboard which allows you to see every little detail. 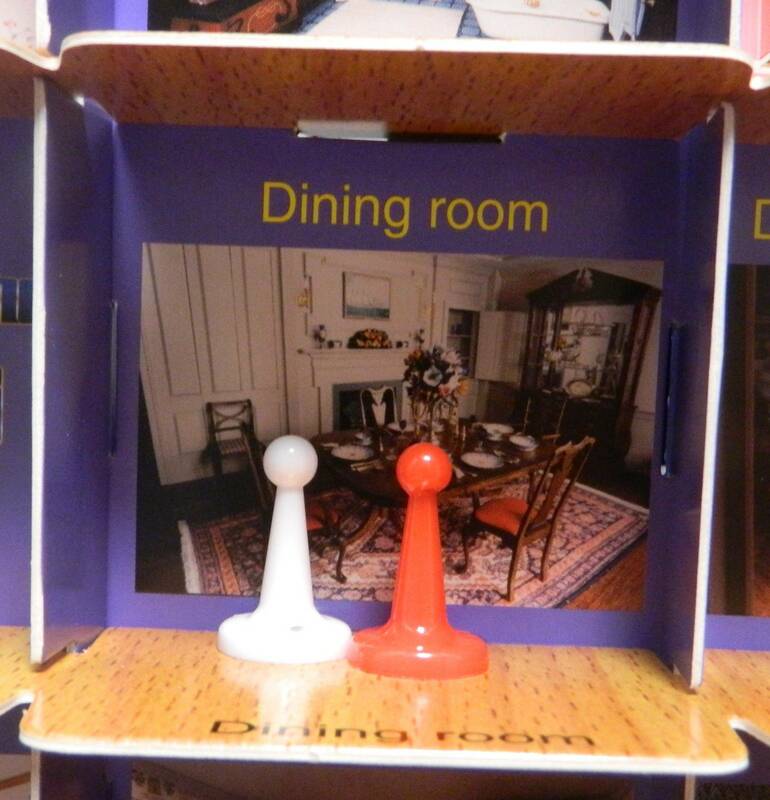 You are given the opportunity to scan the room looking for the objects referenced in the riddles until your next turn. This aspect of the game kind of reminds me of hidden object games or Where’s Waldo?/I Spy. This mechanic is a little basic but I had some fun with it. Finally the game adds a few mechanics where you can mess with the other players. When you land on a space that another player occupies you get the opportunity to send them to another space or steal a card/token from them. 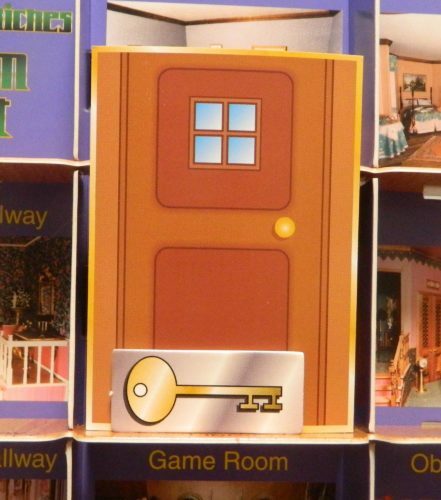 The game also allows you to play doors on rooms which blocks other players from entering the room unless they have a key. These mechanics give players some opportunities to mess with the other players slowing them down. Not being a big fan of messing with the other players, I didn’t get much out of these mechanics. While there are things that I liked about Riddles & Riches, the game has quite a few issues. The riddle solving and searching the rooms are kind of fun. Unfortunately the rest of the game is pretty pointless. It kind of feels like the riddles were designed first and then the rest of the gameplay was slapped together in order to make them into a game. The take that and the movement mechanics are not very fun. They don’t really add anything to the game and just make the game take longer while adding more luck. You could maybe fix some of these issues with some house rules. As the rules stand though, you are probably better off just reading a riddle book instead of playing Riddles & Riches. On top of the gameplay kind of lacking, the component quality is not great either. Most of the components are made of pretty cheap cardboard. The gameboard is kind of a pain to setup and it is hard to keep the board setup when you place it back into the box. While it is kind of cool that the game utilizes a vertical board, it forces all of the players to sit on the same side of the table. There are a few positives regarding the components though. First I thought the artwork for the rooms was kind of cute. 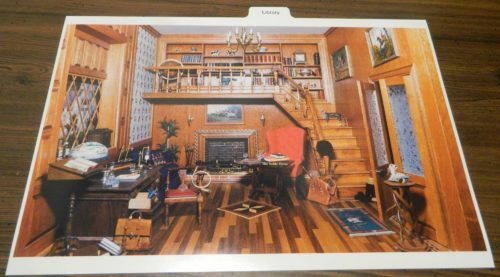 It turns out all of the room photos in the game are made with miniatures which is a nice little touch. I also give the game credit for including 102 different riddles. As you only use three riddles each game, you can play 34 games before you have to reuse any of the riddles. The game also has an expansion pack if you want more riddles. Should You Buy Riddles & Riches? 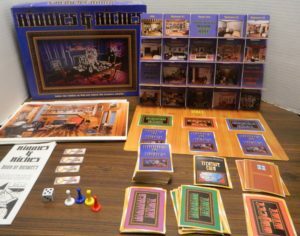 Riddles & Riches is a perfect example of one mechanic not making a game. Despite some of the riddles being quite easy to solve, the riddles are pretty good for the most part. They are fun to solve and give you a sense of accomplishment when you successfully solve them. I thought the mechanic where you search the rooms was also kind of fun. The problem is there is not much else to the game. The mechanics that tie the game together just aren’t very fun. It feels like these mechanics were only added to the game so they could make a board game out of a bunch of riddles. They end up just wasting time and distracting from what the game actually does well. When you add in the subpar components, you are probably better off just reading through a riddle book. If you hate riddles or have troubles solving them, Riddles & Riches is not going to be for you. Fans of riddles will probably enjoy solving the riddles in the game but will probably be disappointed by the rest of the game. Unless you are willing to come up with some house rules to fix the game’s problems, I still don’t think the game is worth playing. If you don’t mind putting in the extra work and can find it for really cheap, it may be worth picking up Riddles & Riches. The riddles are pretty fun to solve. Searching the rooms for items feels like a mini Where's Waldo? experience. Most of the gameplay feels like it was slapped together in order to turn the riddles into a board game. The component quality could have been better.